I found a couple of really, really amazing pieces at Zara a couple weeks ago – this jacquard dress and this faux fur coat. Both I will be taking to London, along with my Vince Brigham booties (thanks for introducing them to me, Rach)! I loved the pliability of this dress – it’s stretchy and comfortable, all while looking like the ideal night-on-the-town number (aka, the perfect travel companion). I’m even more excited by my faux fur coat! It’s winter white, which means it will look wonderful with my new ivory OTTE hat. Since it’s not yet cold enough in Dallas to don the coat, I guess I’ll just have to wait until I get to London! Remember Emma Roberts’ collection for BaubleBar? These earrings are from her collection too. I love the somewhat subtle pop of color and sparkle these earrings bring to my outfits. This necklace, these ear jackets and this Y-chain are still on my list too. Shop more of my favorites from BaubleBar below! These Vince booties really are awesome. I’ve been finding so many great pieces at Zara lately too – their fall/winter collection is to die for! This dress fits you like a glove – so pretty!! Hello gorgeous! Love that dress. And I’m the one who is obsessed with your booties! Aren’t they just the best?! Love this dress and those open-toed booties are so fun! Oh hey girlfriend- looking good! Your hair and make-up look gorgeous! And that jacquard dress is so feminine and flattering! The perfect piece any time of year! Wow, I LOVE your dress! I wasn’t expecting it to be zara, but I love that it is! Have a great weekend, Merritt! This dress is lovely on you! The more I see those vince booties the more I need them! Great fall look! Love the jacket and booties! That dress looks gorgeous on you and I love how you styled it! I love this beautiful dress and these heels are amazing! Love everything about this outfit! You always look gorgeous but these photos = extra pretty. Ooooh, that dress is so pretty on you! And, of course, I’m lusting over those booties. Happy Friday, Merritt! Beautiful polished look! I loving the booties with the heel cutouts…..it makes them so much more interesting and glam. Those earrings are beautiful! Accessories can really change the whole outfit! So Gorgeous, Merritt! I love your accessory choices…they compliment that fabulous dress perfectly. That jacket is great on you! I love this cool dress and the pretty statement earrings. I think I’m due for a zara trip! Love your ensemble. I like the fur too. Very nice fun and classic outfit! 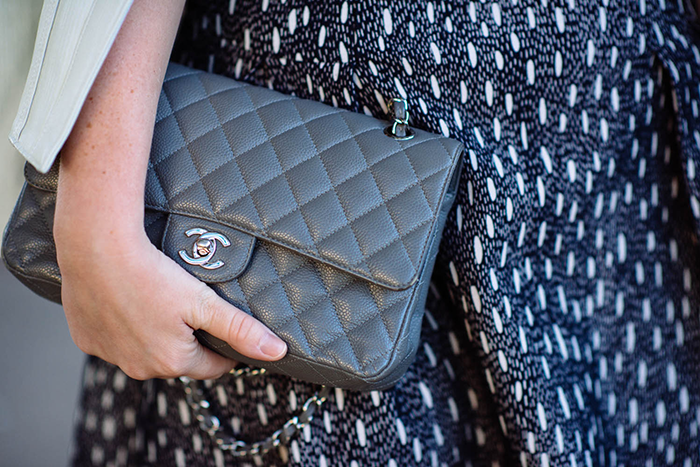 That chanel is absolutely beautiful, that color is insanely gorgeous with whatever you wear it with. Love the print and style of the dress! Very flattering on you and the way you styled it is perfect. Zara has been spot-on lately! Just picked up a handful of their shawls and scarves in various prints, and know I’ll get so much use out of them in the upcoming months. Love the dress, will definitely have to check it out on my next visit! What amazing photos!! You look incredible!! stunning as always! I love these booties! Gorgeous outfit! The heels are so amazing!